The European Universities Games is a biannual multi-sport event organised by the European University Sports Association (EUSA) and this year was held in Coimbra, Portugal. We sent a total of twelve athletes racing in six boats to the regatta portion. This was our most successful EUSA to date with every crew winning a medal which topped both the GB Universities and European Universities medal tables! A fantastic result and the culmination of one of our most successful years ever. The lightweight men's double of Franklin Hamilton and Sean O'Mahony were the first to race on finals day and had a solid race bringing home our first medal, a bronze. This was Franklin's third consecutive medal in the men's lightweight double at EUSA, a huge achievement. Racing next was our men's heavyweight double of Rory Harris and George Lawton. They qualified for their place in the final by winning their heat previously and repeated this success winning the final with clear water. Rory and George have gone from strength to strength this year and this was an impressive result in an international field to top off their first year at Reading. Our women's heavyweight double came next. The combination of Lucy Ryan and Chloe Knight raced very well, holding their heads after being 4th at 500m to go and putting in a massive push for the finish. They rowed through two crews and came away with a silver medal behind a very strong crew from Germany. The men's quad of Olly Dix, Luke Reiser, Laurence O'Connor and Alex Badcott continued the medal streak. They raced well coming away with a silver medal and putting pressure on the winning crew to the line. The last of our men's boat to race was Franklin Hamilton in the lightweight men's single. 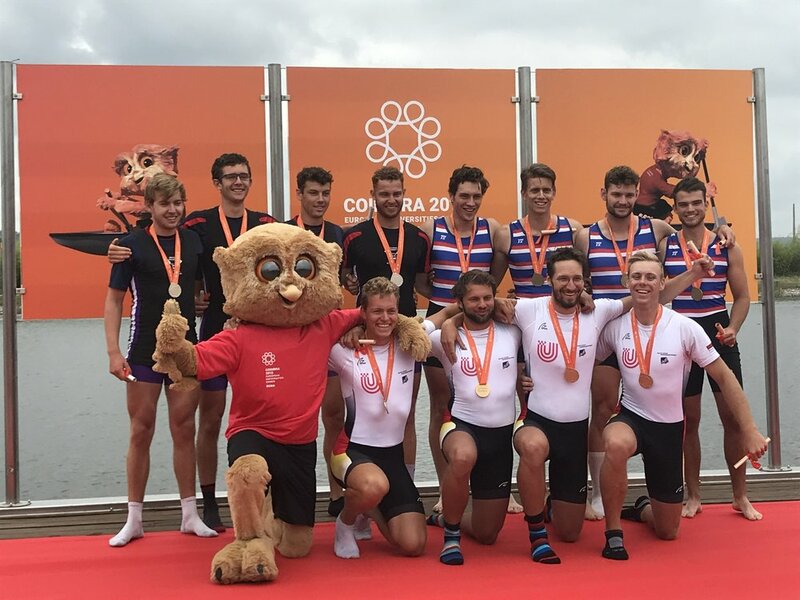 Franklin had a great race after qualifying through the repechage and came away with a silver medal behind a strong sculler from Slovakia. Our final crew to race and second women's crew was the quad of Anna Smart, Chloe Knight, Fran Bratt and Lucy Ryan. They had an exciting race and rowed through Cambridge University and a crew from Germany in the closing stages of the race to take the gold medal, finishing off our day of racing. Overall our time at the European University Games 2018 was hugely successful and consolidated us as a dominate force in European sculling. This was a great end to what has been an amazing year for us including winning medals in every event entered at BUCS Head, dominating the sculling categories at BUCS regatta and qualifying four mens quads for the Prince of Wales Challenge Cup at Henley Royal Regatta. If you want to take part in our success in the coming years and join us at RUBC then email our recruitment officers at rubc.recruitment@gmail.com.